We’d love to meet your best friend! Welcome to Lake Jesup Animal Hospital, a full-service clinic dedicated to delivering quality veterinarian care at affordable rates. We have proudly been serving Central Florida for over 25 years! We realize that your pet is an integral part of your family. Therefore, we pride ourselves in providing the most advanced medical, surgical, and dental care available. Keeping this in mind, you can rest assured that when you and your pet visit our clinic, they will be treated as though they are our very own. Dr. Edward W. Griffith and his entire staff are concerned with your pet’s welfare and well-being. Our services are designed to meet your pet’s needs through all stages of their life. Lake Jesup Animal Hospital has become the go-to place for quality veterinary care. We provide reliable and affordable services dedicated to providing your pets with the medical attention that they individually require. Our staff is comprised of caring professionals that exhibit genuine concern when it comes to your pets. Lake Jesup Animal Hospital has been in its present location since 1989. Doctor Griffith received his Bachelors degree from the University of West Virginia, and his Doctor of Veterinary Medicine Degree from Louisiana State University. He has been practicing veterinary medicine ever since 1981. Dr. Edward Griffith is a member of AVMA, American Veterinary Medical Association, and FVMA, Florida Veterinary Medical Association. He has been a local resident of Central Florida for over 26 years. He is the proud father of twins and a step-daughter. 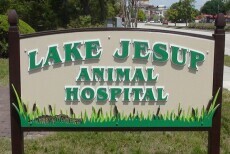 I was raised in Florida and have been working here at Lake Jesup Animal Hospital since May 1994. I have been around animals all of my life and I currently have three dogs and four cats of my own to love. After all this time, I still enjoy working here. Everyday offers something new to learn and new people and pets to meet. I was born and raised in Port St. Lucie and have been living in central Florida since 2005. I've been working full-time at Lake Jesup since May 2008. I graduated from UCF in 2009 with a Bachelors degree in biology with hopes to work with exotic animals, especially tigers. I have a blue Pitbull named Deja, and three cats: Tamaya, Teagan and Tatum. I was born in Milwaukee, Wis. I have lived in Florida most of my life though. Graduated from St. Petersburg Junior College Veterinary Technology program back in May 1989. I have three black cats: Chester, Mali and Yossi. Besides working at the animal hospital, I also work at a golf course. I enjoy football - GO STEELERS!